@Juli51 Thank you very much. I'm happy you're working on an African minifaction. I read about it a while back, and I'm excited to see how it turns out. Your artworks are absolutely beautiful, I like them very much. Something about Nubia and related terms: The term is quite confusing at times because it refers to many possible things: 1) A geographical area generally identified as the area between the 1st and the 6th cataracts. 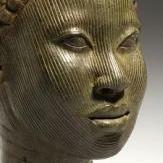 2) Nubian people, who descend from the Noba, 4th century Nomadic settlers on the Nile between the 1st and 3d cataract. 3) Nuba people, a distinct collection of Southern Sudanic tribes, mainly in Kordofan. 4) Nubian languages, refers a Nilo-Saharan language group, spoken by the descendants of the Noba, as well as Nuba people. The Kushites pose a serious question mark here, because Kushites don't seem to be Nubian at all. They didn't speak a Nubian language, they spoke Meroitic (neither Nilo-Saharan, nor Cushitic). Nubian, in ancient Egypt, seems to refer mostly to the people directly to the south of them, and those people formed a buffer between the Egyptians and "the wretched Kush". Kushites often warred against, and subjugated the people of Lower nubia. An additional point is that Kushite territory stretched far beyond Nubia. Some of it's most important cities weren't in Nubia at all, but to the south of it. Meroe itself lies between the last two cataracts. I guess this means a minifaction called the Nubians, side by side with a fully playable faction called the Kingdom of Kush, might be feasible. Although they might be too similar because Kush dominated all of Nubia throughout most of 0AD's timeframe. But you could call your faction Noba, representing the time when they were dwelling in the Western desserts, free from Kushite control. But they would essentially look like an impoverished Kush. There are a number of other attractive African options that are relevant to 0AD's timeframe, but can't be represented with a full civ because we don't know enough about them. But know enough for basic building sets and units: The Garamantes, a Saharan population with a capital at Germa (Garama). They fought wars with the Romans. And of course there's the Numidians. Perhaps the early Axumites, they were quite a powerful, urban culture, but we know relatively little about them. You could also "invent" a generic African mini faction, based on any number of tribes that might interest you. Nuba are perhaps some of the most "stereotypical" Africans, and are what many people would expect to see from "the dark continent". Half naked, throwing spears, round mud huts with thatched roofs… You get the picture. But there is a certain charm to them. Almost "noble savage-like", and their culture seems unchanged from ancient times, so you could use very recent info on Nuba people, like photographs. Either way, I believe the Meroitic Kingdom of Kush, should be a fully playable civ, and it would be really nice to have another African miniciv to compliment them. In reaction to your work, I love both pieces, and especially the second one (a common house I presume) looks quite Kushite. The large ceramic pot, fixed in the floor in the corner of the courtyard is very good. I saw pictures of that in archeological digs of Meroitic sites... The first one, although I love it, is based on "the Old Dongola mosque", and was originally the throne hall for the Kings of Makuria. I believe it is 9th century, from Christian Nubia. That having said, it's basically just a continuum of the masonry culture developed in Kush, so you could still use It I guess. Fig. 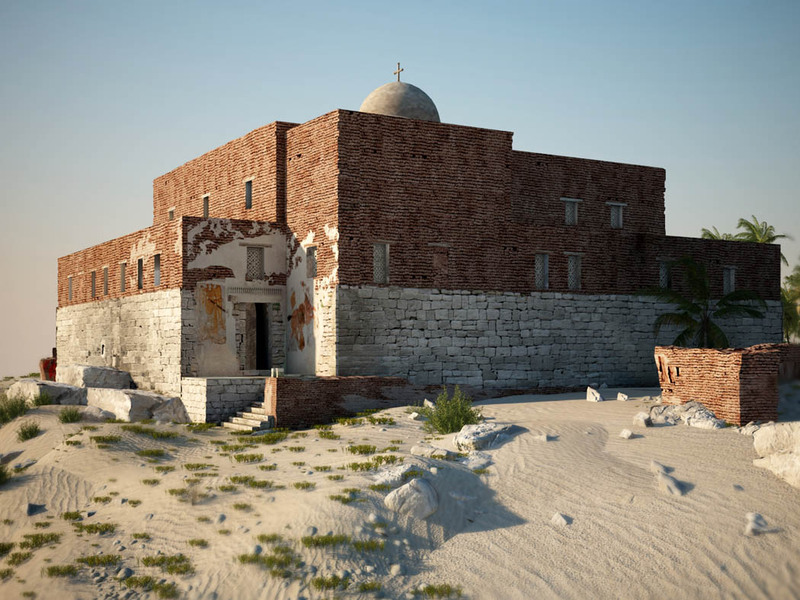 69 A reconstruction of "the Old Dongola mosque" in it's original state, (before it's conversion to a mosque?). Fig. 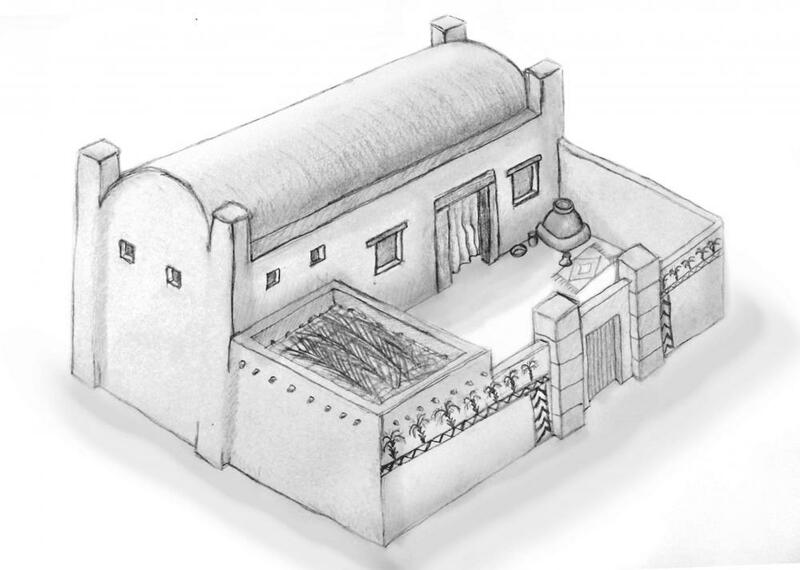 70 My sketch of a (lower-) middle class Meroitic house from the Kingdom of Kush. A good model for a common Kushite house. @SDM Thank you very much. I'm passionate about history in general, and African history in particular, so I'm all to familiar with the difficulties in getting access to quality information. I was 13 years old when I first read about Kush, and it wasn't until I started this thread, that I realized how little I really knew about them. I wanted to share what I've learned so far, because I know how difficult it is to visualize them. Hmm, my background is a bit complicated. My father is Ghanaian, and my mother is part Belgian, part German, part Polish. I was born and raised in Belgium, but I've been living in Ghana for a few years now. I studied science in high school, and attempted applied economics at college (University of Antwerp). All that neoliberalism wasn't really my thing (plus I was a terrible student...). I went to art school in the weekends. Since then I've just been reading, working and thinking. Bueno Lion, Ahora mismo estoy un poco confundido, casi mejor te escribo en español. Tengo varios conceptos a medias para la civ Nubia pero tengo poca información, si embargo Sundiata ha aportado mucha información de otra civ. muy parecida aunque diferente. Tampoco he acabado de entender el significado de mini-facción. ¿Quiere decir una civ inferior a las ya representadas en el juego?, ¿con menos edificios?, ¿mas primitiva?, ¿con limitaciones específicas?, tampoco ahí ningún ejemplo en el Juego. todas estas dudas me impiden concentrarme. Es como una facción pero reducida. Si ves el juego tiene fases, haz cada edificio con el que se desarrrolla las primeras fases del juego. empiezas con lo básico, centro cívico, casas. Farmstead, storehouse. if you are in trouble with architecture we have the same problem to started Seleucids , we have many information and many styles. So Lordgood take the decision to one single line with elements from Persia but mostly Greek, Hellenistic style. the houses have the variations of all civic structures, the proof of concept is made a CC so then the houses. becoming again with minifactions the team have their concept and modders have his own. team concept is about a faction that don't be included in game and have few units and few buildings. for modders this change in one single point, "how many information we have to create a full playable faction, if haven't enough is considerate minifaction, because you can't go more far than history and archeology. That's why @wowgetoffyourcellphone say about create this a full faction in a mod. The team in this point don't need this faction, but need the variation to scenarios, campaigns , etc, etc. Manifsctionb viewed as developer perspective non gameplay/ player perspective. here I do my perspective as modder and I declined about Bronze Germanic faction. and this the official perspective. 1 - Nubian (Noba) Civ, (indicate buildings). 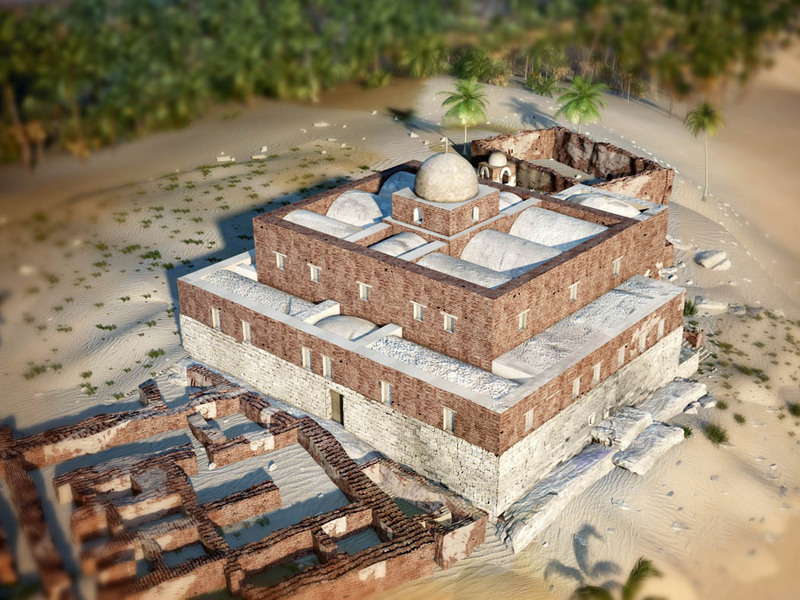 2 - Nubian (Noba), (indicate buildings). 3 - Kushite Civ, (indicate buildings). 3 - Kushite Mini-faction, (indicate buildings). 4 - Pre German mini-faction, (indicate buildings). 5 - Other civ. or mini-faction, (please describe). In case of Nubian and Kushites together, please indicate common shared building concepts. Germanic bronze was indicates for Aristeia mod. The conclusion of @Sundiata research is, that creating a civilization mod for the Kushites is possible. We have enough information and material to create a playable civilization. The Kushites differ from all other civilizations in 0 A.D. regarding units and houses at the same time they would integrate well with other 0 A.D. civilizations. The only historical limitations we will have, because there is not a lot of material available, is regarding ships, boats and to a certain extend siege weapons. However, these limitations do not affect the representation of the Kushites as being it's own independent culture. I furthermore decided to take responsibility over the development of the Kushites mod. I really want to see the mod become a reality. In addition I would love to get support from @Sundiata and the rest of the community. My first step is to create a git repository for the development. I would like the new repository to be in the existing "0ADMods" (https://github.com/0ADMods) group/community. I would really appreciate if anybody can help me out whom to contact to be able to create a repository within the existing "0ADMods" group/community. After the repository is setup I would like to review and restructure the collected material to identify topics and subjects which need more research. 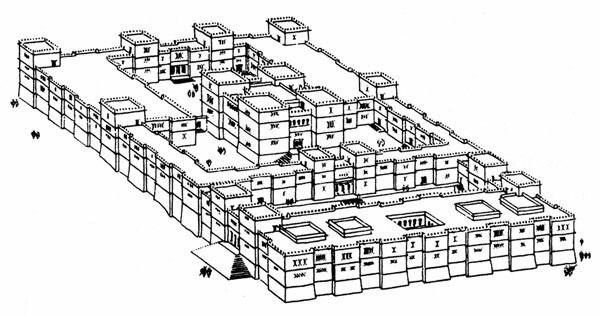 Of all the buildings, civic center should be based on the typical Kushite palaces, like the one at Karanog (fig 14). These palaces were administrative centers, storehouses for food and luxery products/trade items, and served as living quarters to governors. This is where dignitaries would be received, and policies would be made. Literally town centers! Maybe reduce the height from 3 stories to 2 stories. Some miniature obelisks or stone inscriptions decorating the front. A set of pillars with papyrus shaped capitols at the entrance, with a single stone slab on top, to make it look inviting. @Lion.Kanzen Is there a document with all the terms for buildings and units in other languages, especially in Spanish? Buildings and units have separate .po files for translation, you could create an English to Spanish table by looking at the Spanish translation. Guys only I was guide juli51 we can create a topic about this matter and define minifactions concept more clearly. probably need recopile history about where we get the idea and the process to assimilation by the team. In english is Ok. my english is good enough, I was jus a bit confused and stressed, that's why I wrote to Lion in Spanish, I had no time for proper translations . By the way, I offer my drawing skills to any mod developer or O. A. D. developer or direction or game governance, or whoever wiling to do something in O. A. D. but mi time is limited and I can only focus in one task at once, so I need: a formal proposal (so I know who is in charge), clear instructions and as much documentation as possible for each task. So, the Kushites should definitely be represented with a fully playable civilization (mod), based on the references in this thread, and future research. We have more than enough, I believe. Representing the Nubians with a miniciv is problematic because Nubian territory was entirely controlled by the Kingdom of Kush for most of 0AD’s timeframe (during 0AD’s timeframe Nubia and Kush are indistinguishable, with a southern capital, at Meroe). @Juli51 & @balduinThe house I sketched in fig. 70 (based on juli51’s drawing) should be the first model for a common house. The floor plan, building style and features are purely Meroitic Kushite. Perhaps Juli51 could make a proper drawing of it with some props, and it’s good to go (if the man has time of course). @Juli51 & @Lion.Kanzen ,Could you direct me to your preferred, existing topic, or create a dedicated new topic somewhere on the forum, where I could assist you with references to African and Germanic cultures and their history, as a basis for your minicivs. This way, we can use this thread to focus on the Kingdom of Kush, and use another thread for ideas and references on minicivs. Then you can create a specific outline of what you want and what you need. Then I will love to assist you further. 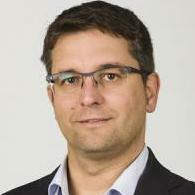 @balduin: I commend your courage. I would like to take charge of the Kushite mod myself, but I’m afraid I’m just not “tech-savvy” enough (I will be working on this though). For example, when I open github.com/0ADMods, I barely understand what I’m looking at. If you are confident you have what it takes, and are dedicated to representing a historically accurate Kingdom of Kush in 0AD, I will support you. I just wish to remain intimately tied to the development of this civ. I also hope that anyone in the 0AD community, who has the time and the will, supports this mod and contributes to its development. I only hope, very sincerely that any stereotypes and erroneous preconceptions are strictly avoided, in order to do true justice to the Kingdom of Kush (this means no Massai- or Zulu- type shields for the Kushites, or their mercenaries). I really love everyone’s interest in this topic, and I truly hope everybody realizes the full potential for this faction. It could be one of the prettiest, and most exciting in the game. In a similar way as the Mauryans were created, Kush could be a crowd-sourced project. Anyone that has gone through the info, and internalized the visual references presented in this thread, should, in their own time, feel free to create models, designs and present ideas relevant to the development of this faction. I will be forever grateful to anyone contributing, in any way, in order to make this project a success. Ok, using last link I will get a trick. second point we are doing this primarily for vanilla game so if somelese are talking about mods, there a mods section. probably I will open a task in the forums to cut this task from extra information. We need a single direction to make this. and nobody in art departament take this seriously if isn't in art forum as a task. The full civ is less important right now , Justus may be will be more interested in the developenmt. In council of modder we have plenty work to do with a Aristeia and Millenium. I'm definitely interested in the Kingdom of Kush and I wouldn't mind if it ended up being in the main game as a full civ for various reasons already mentioned in this topic. However my hands are currently really busy with unit animation stuff and even though I'm sure I'll end up doing art for Kush mini-faction/mod/civ, I think there are currently other areas in the art front that need more attention for now. So yes I'm interested, but I should focus on other stuff for now. I think 25th Dynasty would be an awesome choice for Aristeia. I looked through your forum, and it looked really interesting. It's a very interesting timeframe to depict. Before the rise of Rome… Before Alexander… If you need some help with research or something, let me know. I will go through the forum again and see what I could contribute. Thanks; if I do decide to for sure include the 25th Dynasty for Aristeia, then I will definitely let you know. I may also be able to assist with research for the Meroitic Kushites. But again, with all of the responsibilities I have at the moment, no promises! You need a texture pack first,otherwise modeling becomes horribly inefficient. @Enrique , @Zophim & @LordGood Thank you very much for your replies! Don't feel any pressure at all. Any contribution is welcome, and even if you can't, your support is worth everything! How should I (?) get started on a texture pack? @Lion.Kanzen Actually I believe that the picture you shared represents the "Malians", (s****y choice for a name, should be Empire of Mali). The "Ethiopians" are also represented in the game, but they are not the Kushites we're talking about here. They represent the Aksumites, or the Empire of Axum (from modern day Ethiopia and Eritrea, not Sudan). As I have mentioned before, they are a very interesting civ to research. Built massive stone palaces (Dungur palace), erected the world's largest stone stelae (Axum stelae, or obelisk of Axum). Built beautiful monasteries (Debre Damo is an 8th century monastery, still standing in it's original form and gives you an excellent idea of Axumite building techniques), Their culture is a mix of black African, South Arabian (Sabaean, Marib) and Jewish (Beta Israel, Falasha). And their history goes back to about 1000BCE (Temple at Yeha, Kingdom of D'mt). Traded through their seaport at Adulis (modern day Eritrea), and had extensive contact with the Arab, Indian, and later Roman and Byzantine world. Greeks from Ptolemaic Egypt sent regular elephant hunting expeditions to the area. Axum eventually invaded and destroyed the Kingdom of Kush, as well as conquering South Arabia (Himyarite Kingdom). They are ideal for a mini-faction, because their units are a bit of a mistery (to me at least), but their building set is doable. Fig. 71 These are the "Ethiopians" you are referring to. They are actually the Axumites (Aksumites) of modern day Ethiopia. Very interesting for a miniciv. The building set shown here is pretty decent, except the white building in the upper right corner is completely wrong. That is an exact copy of Larabanga mosque, the oldest still standing building in Ghana (West Africa), my home country. It's 12th century. Fig. 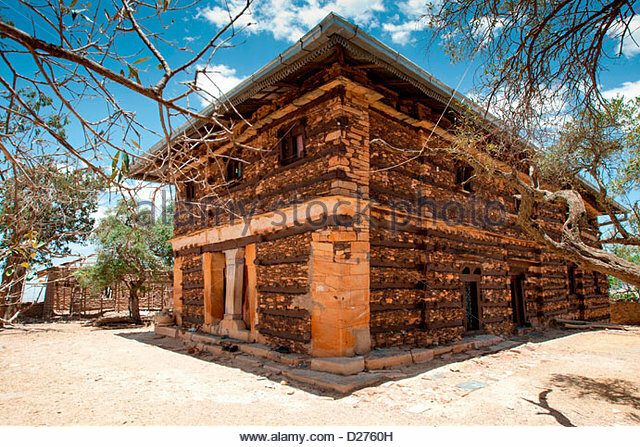 72 One of the finest examples of Axumite architecture still in existence, The monastery at Debre Damo, 8th century. Fig. 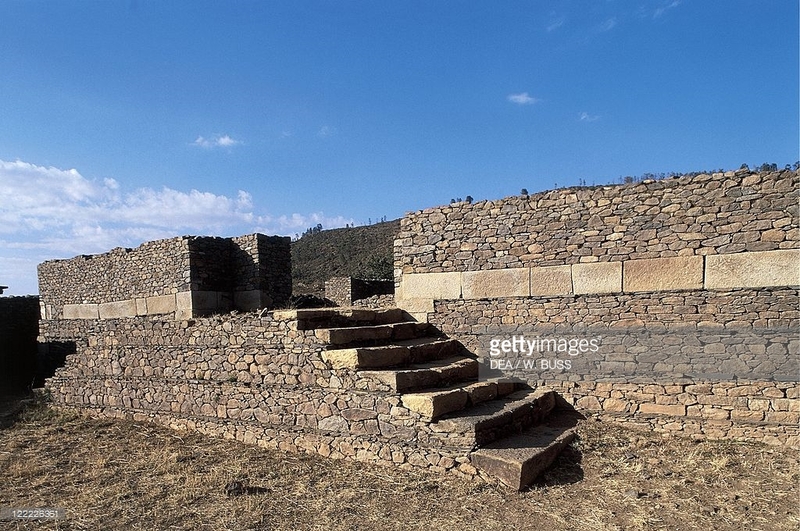 73 Dungur edifice, 4th-6th century AD, modern day Ethiopia (Axumite). Yes indeed but how these people evolving from ancient Kushites to Middle Ages Kushites. 8th century this even match with second part. There are no medieval Kushites After the fall of the Kingdom of Kush, due to the Axumite invasions of the 330's, the territory split into three Kingdoms. The Kingdom of Makuria (capital was Dongola), Kingdom of Alodia (capital was Soba) and the Kingdom of Nobatia (capital was at Faras). From the 5th or 6th century they became Christian, and built cathedrals (Dongola and Faras). Makuria eventually absorbed the other two kingdoms. When Arabs of the Rashidun Caliphate invaded in 651AD, they were beaten at the two battles of Dongola, and subsequently set up a peace treaty with the Kingdom Makuria, called the Baqt, which lasted until the 13th century! The Kingdom of Makuria remained a power until the 14th century, when it's population became Arabized, and Sudan became Islamic. @Lion.Kanzen Here are some visual references for Medieval Nubia. 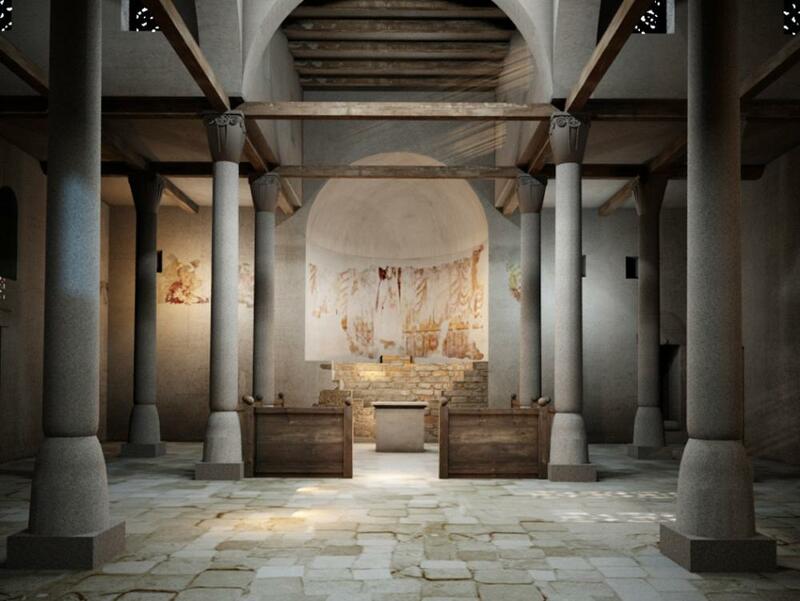 This is just the tip of the iceberg, one of the finest historical reconstructions I have ever seen, of the cathedral at Faras, 7th century. Typically christian Nubia, with very clear and strong Byzantine influences. Note the Nubian vaults, still prominently in use. Once you have more or less the main tones for the building set, think about which materials you'll need for the buildings and look for textures of those materials and blend them with your chosen colors. After that the best approach is to do a proxy model (a house or a small building) so you can test the combinations and the style. After that is just having good references/concepts and keep improving the texture as you create them.